April 2015 - Whiteboard Consulting Group Inc.
How often have you heard (or said) “it’s not on my performance objectives, so it’s not a priority for me.” For many people, the simple act of measurement increases motivation to perform. The term “eustress” refers to “good stress,” or the opposite of distress, and captures that healthy response to stress we have when something is attainable, but almost too far out of research. Research shows that the desire to win is heightened when rivalry and time pressure coincide, and the simple act of measuring something sparks that sense of rivalry in many people. Of course that rivalry doesn’t need to be with others, it can be with one’s own self as a sort of “competition” to see whether you can beat a goal. Without a measure, there is no way to determine whether you have won, and therefore, less motivation to get something done. There’s a small matter of accountability. When we set goals and measure performance against that goal we have the ability to hold ourselves (and others) accountable for the resulting success or failure. We actually have concrete data that shows us what we did or didn’t do, what the impact was, and what we need to do differently. Without accountability we can’t coach people towards success and growth, and we have a heck of a time meeting our overall targets. Of course not. In addition to things like project planning, project management, and change management, there is this little matter of measuring the right things. Understand the difference between a measure and a metric. Understand the difference between an Outcome metric and a Performance metric. 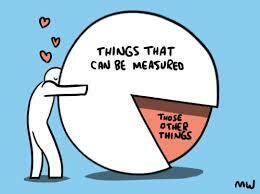 Figure out what you want to know before you start measuring things. Often times reports are a dumping ground for all the data that’s available, whether it’s useful or not. These types of reports do NOT contain the motivational metrics and measures that create eustress and increase performance. Design your report to tell a story. Once the right data is measured and collected, the report should contain eye-catching information to lead the reader to the most important points. Make it visual, interesting, and helpful, and you will become the “go-to person” for people who want to know what’s going on. We are teaching a course in Toronto on the basics of Performance Measurement. It’s a two-day course on May 26th and May 27th, and if you’re interested in knowing more about how to move your organization towards one of data-based decision-making, then click here and register today.